New Again Carpet Cleaning cleans all kinds of surfaces including tile, laminate, vinyl, and linoleum floors. We offer floor microfiber dusting as well as stripping and waxing. Our other cleaning services range from post-construction cleanups and fire restorations, to providing businesses with full-time custodial staffs. We offer 24/7 emergency water and sewage extractions to mitigate the damage done to your carpets, floors, and furniture. New Again Carpet Cleaning, Inc. provides Fayetteville, NC, and the surrounding area with unrivaled carpet and floor cleaning services. We also do fire restorations, air duct cleaning, interior painting, and more. Our custodial staff provides commercial clients with cleaning services using ecofriendly chemicals that are safe for your customers, our employees, and the environment. Jeffrey and Lisa Houghton’s family-owned and -operated cleaning business has been serving the Fayetteville area since 2004. 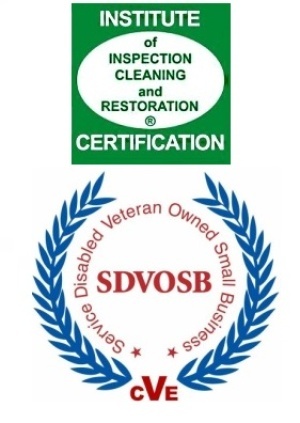 New Again Carpet Cleaning is a Service-Disabled Veteran-Owned Small Business (SDVOSB). We provide our services to commercial and residential customers in Spring Lake, Raeford, Hope Mills, Cameron, Pope Air Force Base, Fort Bragg, and the surrounding areas. Every member of our team has earned their Institute of Inspection Cleaning and Restoration Certification (IICRC) and undergone training through the Cleaning Management Institute (CMI). We hold weekly meetings to update our team on issues including safety procedures in compliance with OSHA regulations. You will find that our staff is very professional and courteous at all times. We are members of the Fayettville Chamber of Commerce. We were named Associate of the Year in 2006 by the Cumberland County Apartment Association (CCAA). In 2011, the U.S. Chamber of Commerce voted us the best carpet cleaning company in the Greater Fayetteville area. We have an A+ rating from the Better Business Bureau (BBB). We are fully licensed and insured. Having a carpet in your home not only acts as a wonderful flooring but at the same time adds to the aesthetic beauty of your home’s interior and increases its value. Apart from the visual appeal, there are numerous health benefits associated with carpet cleaning. Having your carpet cleaned by a professional carpet cleaning company ensures your home is safe from dust particles and harmful allergens. We, at New Again Carpet Cleaning, understand the importance of clean carpet and provide best in class carpet cleaning services in Fayetteville, NC. Our professional carpet cleaners use state of the art equipment and best practices giving you a complete peace of mind knowing that the job will be done right. Having mastered the carpet cleaning process, we’ve been a leading carpet cleaning company serving residential and commercial clients in Fayetteville and nearby areas. Let’s face it. Life is busy and it’s really hard to devote time to cleaning your home after long working hours. House cleaning becomes a tiresome process when you have a large home or a limited time frame. Residential cleaning services help you save considerable time which can be utilized in a better way. Luckily, New Again Carpet Cleaning makes it easy for homeowners and property owners to maintain a clean and organized home. As a leading house cleaning company in Fayetteville, we believe in customer satisfaction and take time to understand your special cleaning needs. Based on your preference, we work to create a cleaning plan for you. Our weekly, bi-weekly and monthly cleaning plans will leave your home sparkling clean ensuring you lead a healthy lifestyle. Being well-acquainted with latest cleaning equipment makes our cleaners highly efficient and allows them to offer cleaning services in a timely manner. No matter what your requirement be, you can count on us to get the job done. For most employees, the office is like a second home. That is why your office staff deserve to work in a clean and hygienic environment. Hiring a janitorial service in Fayetteville is a perfect way to ensure your office remains clean and your employees enjoy working there. Additionally, your office becomes more welcoming and friendly attracting more clients. When you are dealing with customers, a clean office is a prerequisite. Commercial cleaning services from New Again Carpet Cleaning are aimed to deliver cleaning services in a timely fashion. As a reliable and trusted commercial cleaning company in Fayetteville, we put in every effort into providing you a clean working space. Our professional cleaners pay close attention to details resulting in an unmatched quality of services. To provide an unparalleled level of janitorial service, our staffs adhere to strict quality control measures. If you are looking for a trusted carpet cleaning and janitorial service in Fayetteville, you can count on New Again Carpet Cleaning. Contact us at 910-987-0000 for an estimate.